I cannot believe we are leaving Bali next week! I keep having dreams about Berkeley and I already feel part of myself transitioning to that other life of ours. Even though we have another month of travel before we step foot in California, I feel in limbo. I am totally excited to see Bangkok, Greece, and Turkey, but after ten months on the road, I am also happy to be coming home. As I have mentioned before, we are always trying to get creative about snacks for Otis and Lilah, who seem to be having continual growth spurts accompanied by insatiable appetites. A while back, our friend Johnny loaned us this little, light-weight box of an oven that rests on top of our two-burner stove. I thought you might get a kick out of this clever invention. As you might imagine, we were thrilled to have an oven. We baked many batches of cookies and started regularly roasting veggies for supper. The temp gauge wasn't exactly accurate and some corners of the oven were way hotter than others, so we've had to be pretty flexible about the whole affair. 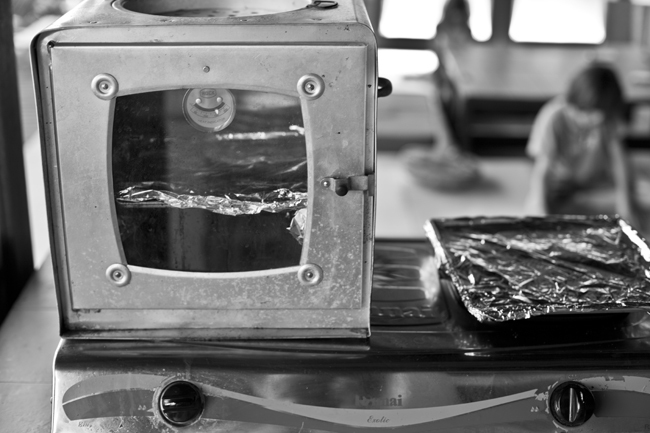 But who cares - we had an oven! Recently The Notorious Experiments posted gorgeous sweet potato fries, which totally inspired me. Then I saw more yummy fries at A Chow Life. I thought, why can't we make some of those here in Bali? Always a sucker for dishes using only 3 ingredients, I ended up doing a very simplified version of the fries. I hope you'll give coconut oil a try. It gives such a subtle sweetness that works beautifully with the sweet potatoes. Preheat oven to 425-450 degrees. 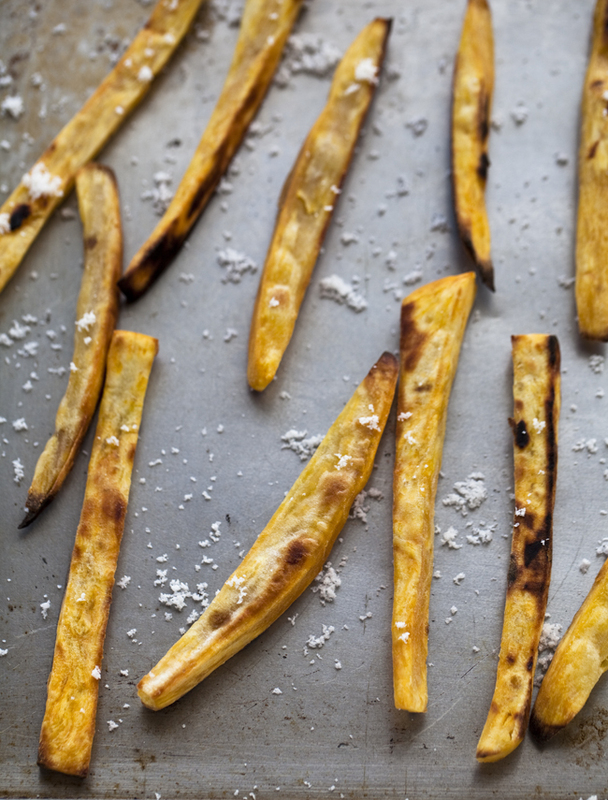 Peel sweet potatoes and cut into french fry-style sticks. Place potato pieces in a bowl and toss with coconut oil and a few pinches of salt to coat. Scatter fries on a baking sheet (I did some batches using tin foil to cover the baking sheet, but finally gave up on the foil finding it unnecessary.) Place fries in the hot oven. After about 7 or 8 minutes, remove fries and turn them over to insure even cooking on all sides. Bake for a total of 15-20 minutes (depending on thickness of fries) until potatoes are tender and cooked through. Sprinkle with additional sea salt. Serve. Enjoy! Okay. Some of my fries are a little burnt, but I am doing the best I can with this funky oven! Otis and Lilah didn't complain at bit. Only three ingredients? Sign me up! I've made sweet potato fries before, but never with coconut oil. I bet that makes for a interesting flavor. Thanks for sharing. Carol, yes the coconut really does add another layer of flavor to the fries. I love it and hope you do too! I love sweet potato fries! They are one of those delicious twists on an old standard. These photos are glorious, as well. Beautiful post. Paul - thanks so much! Amazing photos. Yummy is the word! Are there different types of coconut oil? yum. oh my goodness. we get to cook together soon. makes me happy. Phyllis, yes we get to cook together soon. Can't wait! Anonymous, really good question...Here in Bali, I get a traditional homemade coconut oil made by the older ladies just next door, its consistency is similar to olive oil. In California when I buy organic coconut oil, it is often thicker, more like shortening. If you heat it a bit, it should melt and can easily be used to coat the sweet potatoes. I am also wondering if we can find some of this more liquidy coconut oil in the US. Not sure. I am so addicted to the flavor and aroma of coconut oil, I think I will be using it more and more at home. 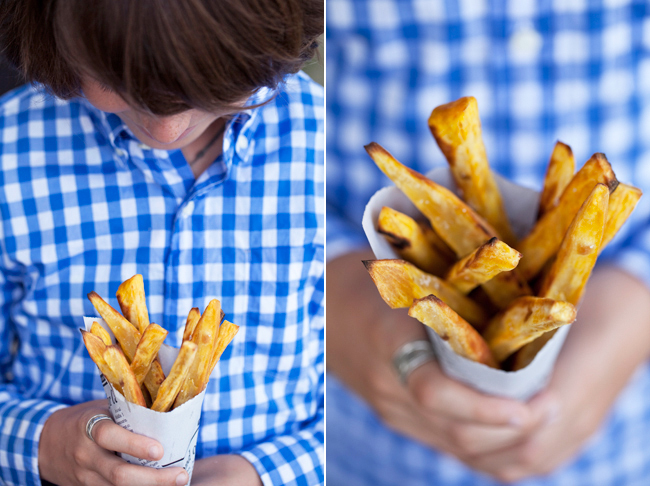 I especially like those with Otis in his blue checkered shirt, it creates such a great, contrasty background for the fries. I have to tell you, I've been obsessed with sweet potato fries lately myself. They are super delicious! I love making home cut & roasted normal potato fries and I love roasting sweet potato in chunks... why did I not think of this! Gorgeous. I always think that's one of the nicest things about traveling - starting to get excited about coming home. You never believe you will when you leave - it's like magic! Transforms your everyday into something as special as any exotic places around the world. Poire au Chocolat - so true about travel... I so hope we can bring that feeling of wonder home with us. Sweet potato fried = divine. I eat them all the time. What a wonderful trip and when you get back, you'll look at everything with new eyes! The coconut oil thing is something i need to try! Wistful sigh...I do love what coconut oil does for food. And I LOVE Sweet Potato Fries. I want to do them Belgian style with coconut oil some time soon. I hate that your on your way back from your vacation! I am still waiting for each and every blog to see where you are, what you are doing, and what you are eating! Sometimes I swear I can smell the food in your pictures. Hope you all have tons of fun! Oh these look good. Can't wait to see you guys! Barbara, I cannot believe it took me so long to make sweet potato fries - I was seriously missing out. Oli, I so appreciate your comments. Thanks for all the kindness! Sippey! Cannot wait to see you guys either. That picture of you and Kate at the pool cracked us up. Give hugs to all three of your ladies for us. I made something similar the other night—I just added two smashed garlic cloves to mine. Yum! This might be a silly question, but is the sea salt different in Bali then in California, or is it similar. The looks like coconut shavings in the pictures so I was wondering about the texture and taste. GORGEOUS PHOTOS! Smith & Ratliff, must try the garlic addition...Makes me think of tostones (savory plantains) with garlic sauce - one of my favorites! Anonymous, I haven't researched this, though the Balinese sea salt does seem exceptionally flaky, almost powdery soft. The flavor is also nice and mild so you can add a lot of salt. I think there is a big difference in flavor and texture in various sea salts. I am pretty sold on the Balinese stuff - it is fantastic! I need to try these in the oven, ha I tried on stove top frying them and while they were glorious they were a lot of work to double fry. Oh double fried was the only way to go. Bakingbarb - double fried... yum!!!! Isn't that the funniest oven. Makes me smile every time! ah i cant wait to try this with the coconut oil! Somehow, my sweet potato fries never look this good. Beautiful! So excited to find this site. Love your sense of adventure and admire your spirit! Are you from Berkeley? Lucky you! I am a bay area native myself, and I can't quite decide if I want to live in Berkeley or SF when I grow up. ...and Bali must have been amazing! And your sweet potato fries look delectable. Anushruti, Jean, and Megan - Thanks so much for the nice comments! We just had sweet potato fries last night...I'm so addicted to them. Sigh. They are my newest love. Loooove your oven. Amazing! And, like everyone else has said, great idea to use the coconut oil. You've inspired me to pick some up ASAP. Hope you enjoy the coconut oil, I am such a fan! Hey, just curious. What is that oven called and is it available in Bali. I just moved here and don't know if I'll be able to swing a big oven. Great recipe by the way, and great blog. Hey there Mike, So jealous over here that you have just moved to Bali;) Congrats! I'm don't know much about the oven since we borrowed it from friends. I think it is called "Hock" and it seemed to be made of aluminum. You could ask my Johnny at Bali Eco Stay, I bet he knows where to get one. Mike, The oven is called an Easy Bake and costs anywhere from $20 to $40 depending on the size. I have lived in Bali for 23 years and until last year used an Easy Bake for everything including Thanksgiving Turkey. I know this comment is a bit late but I was just turned onto your lovely site, Erin. Last year I splurged and bought a 'real oven' an Italian beauty called La Germania. It is wonderful and I'm thrilled to have it here in my Ubud kitchen. I write the recipe column, "Food Glorious Food" for the expat paper, 'The Bali Advertiser' so thought it was about time to have an adult oven to cook with. Keep up the wonderful recipes and photography! What a treat to get your note! Reading it made me long for Bali, and Ubud specifically. Lucky you to live in such a special place! Maria, thanks for leaving a note for me here. I'm so glad the recipe worked out for you!